About 200 men arrived and drove them into the night. Divided into small groups they were martyred at various places over the next three months. Six were martyred on 23 July at Manganares and on the same day nine at Carabanchel. Two days later three more were killed at Erda. Two months later two were martyred at Carrion de Calatrava on 25 September. In the following month the final group of six were martyred on 23 October. Their Memorial is observed on 24 July, the available date nearest to the date on which the first group, under the leadership of their Provincial, Blessed Niceforo Tejerina, was martyred. 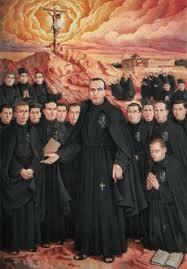 They are the first Beatified Martyrs of the Congregation of the Passion. Pope John Paul II beatified them on 1 October 1989.